Cooperative phenomena in the animal kingdom are very frequent. For example, group hunting enables lionesses to have greater success in capturing preys, especially, those of larger size. Group life allows mothers to care for, feed and better protect their cubs increasing in such a way their survival likeliness until the adulthood. 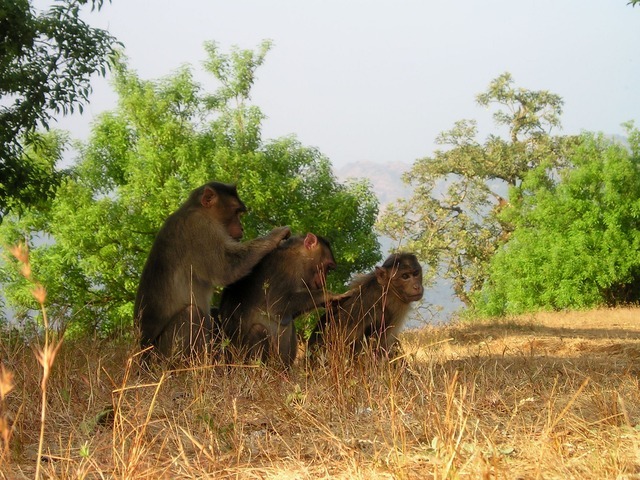 Monkeys, on their turn, live in social groups and this brings to them some important advantages like protection of food sources against competitors, although an increase in the number of individuals in a group can influence the quantity and distribution of the available food in a given environment. This is an important aspect in determining the ideal size of primates’ groups. Other advantages are: avoid predation, generational learning, easy access to mates or breeding partners, infant care, the development of social activities, specially, mutual grooming to reinforce bonds between individuals within the group, etc. See, for instance, “The social role of touch in humans and primates: Behavioural function and neurobiological mechanisms” by R.I.M. Dunbar. Ants like Honey bees are eusocial insects that belong to the order Hymenoptera, one of the largest orders of insects. The name Hymenoptera literarily means ‘membrane wings’. Ants have spread through almost the entire world (they can be found in all places on Earth except Antarctica and some isolated islands) and compose about 15–20% of the animal biomass in most terrestrial environments (Holldobler and Wilson, 1994). They have developed into a highly specialized model of society in which the division of labor depends on the needs of the colony and on environmental and external factors. Ants colonized the land millions of years ago and have evolved into a complex hierarchical organization of castes. This type of social structure has allowed them to adapt to diverse environments, even the most hostile. Through evolutionary pressures over time, acquired knowledge and interactive teaching, ants have developed a high degree of self-organization, efficiency and adaptability that even today continue to fascinate researchers worldwide. The colonies have different sizes and are comprised of one or a few queens and a cast of female-sterile workers. Each member is assigned a specific role within the colony and the individual actions are governed by simple behavioral rules. The role of male ants is to mate with the queen. The queen is a reproducing adult female and the founder of the entire colony. She is the only one that lays eggs and usually tends to have a long half-life with respect to the workers. The worker ants are non-reproductive females and are responsible for the tasks in the colony. So, we can find individuals specializing in cutting leaves, defending the colony, taking care of larvae by feeding and washing them, fungus growth- as an indispensable mechanism for getting essential nutrients from food- etc. These insects are able to build amazing underground cities with lots of tunnels and chambers dedicated to different purposes: nursery, food storage, garbage dumps, etc. 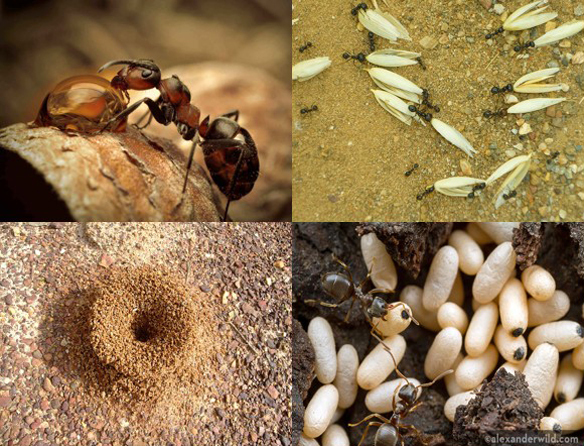 They are also able to fertilize the surrounding soil by means of the variety of nutrients produced around their nests and contribute to the dispersal of seeds; reasons for which they are considered authentic underground factories that play a decisive role in the balance of the ecosystem. They use a chemical language (pheromone markers), sounds, physical touch (they touch one another in certain situations as a stimulus for activating an individual) and diverse environmental cues to coordinate their actions. On the other hand, it is well kown that cooperation and collective phenomena in animals result from the interaction among individuals that try to maximize their own evolutionary fitness. From a Complex System’s perspective, ant colonies like human societies represent a clear example of complexity and self-organization. The emergent properties and behavioral patterns of the whole system are the result of the interactions between individuals who make up it. The structure and dynamics of these interactions allow the emergence of collective patterns of behavior that could not be identified and properly analyzed if the system’s elements were analyzed individually. Therefore, we advocate for the study of these kinds of systems from a holistic perspective, that contrary to the reductionist way-of-thinking (the approach that has dominated scientific thinking during centuries), is based on the fact that the whole is more than the sum of its parts. As a result, many social and cooperative behaviors observed in ant colonies and other complex societies in nature can be examined from a different perspective through the study of the relationship between the structure and dynamics of their individual constituents. © 2019 Cosnet. All rights reserved. Web designer: S. Almonacid. Web content: COSNET and L. Couto.